I'm a goal setter. I'm a goal planner. I often fall short with a key word to reaching your goals - implementation. My goal setting is like planning a road trip. I want to leave Atlanta and head out for a vacation on the West Coast. The West Coast is my goal. (Like "Ironman") Well, I put a giant map up on the bedroom wall showing every road in the United States. I start looking at the map. I put a big dot on Atlanta and a big dot on a random spot on the West Coast and hmmm. Yeah, I can drive almost straight across. About 2200 miles. Awesome. It'll take about a day and a half of straight driving. And then I step back. Oh. Look, there's New York City. I could squeeze that in on this trip. Oh. And there's Toronto, and Thunder Bay, and Chicago. Well, since I'm out, I should head over to Louisiana to visit family. Then, oh, I'd like to go to Denver. Oh, but I missed Amarillo. And I love that song, Amarillo By Morning. Now, I'm humming a George Strait song, I see Phoenix. And how could I drive ALL this way without going to Las Vegas. From Vegas, I'll head on over to the Coast. Yeah. That's my plan. 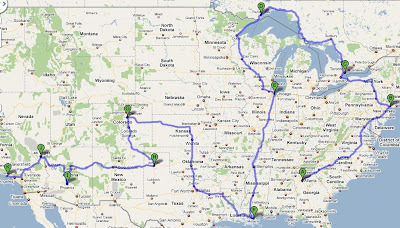 The plan that went from 2200 miles to over 7000. The plan that went from 2 days to reach my goal to almost 5 days to reach my goal. I step back and look at this crazy plan that I've devised and go "Yeah, This is the most AWESOMEST plan ever. I'll leave tomorrow morning bright and early." I go to bed, unpacked. I sleep in. I wake up and see that map on the wall and go "It's too much to think about today. I'll just leave tomorrow!" Tomorrow morning, I rollover again, and say, "Tomorrow, for sure." After a week of putting off my trip, I decide that my trip is too much. That I should cut out a few stops. I mean, I can always add Toronto in on another trip, right? So, I rip the marred up map off the wall, get out a new map (because I have an endless supply of maps,) and start all over again with my planning. So, what does all this mean. It means, I think, that I'm too focused on the big picture and I'm missing the trees for the forest. I'm so enamored with the idea of Ironman (or whatever goal I'm currently focused on), that I tend to lose sight of what I need to focus on now. I fail to plan for the day-to-day, week-to-week in order to plan (and re-plan) for the distant future. I think it means that I often spin my tires, make little progress, and then get frustrated because that distant future doesn't get closer. And we all know what that means - it means there was a fault with my plan. No, what it actually means, is that I had a plan. I had a solid plan. I just failed to execute. I failed to give the plan an opportunity to work. Where do I go from here? I dunno. I just needed to get all this out. Get the process of fixing the problem (non-execution) out on paper so I can begin to mull over the solution. Looks like an awesome road trip :) You would head through my current town (NYC) and then through my hometown (Duluth, MN). I do this a lot too and I think just getting it all out is an important step! I see what you're saying - I really do! For some, it's hard to see the big picture and know what it is they're really driving for! I, myself, am AWFUL at annual goals. I'd rather do smaller monthly goals. Hang in there - you'll find what works best for you! !